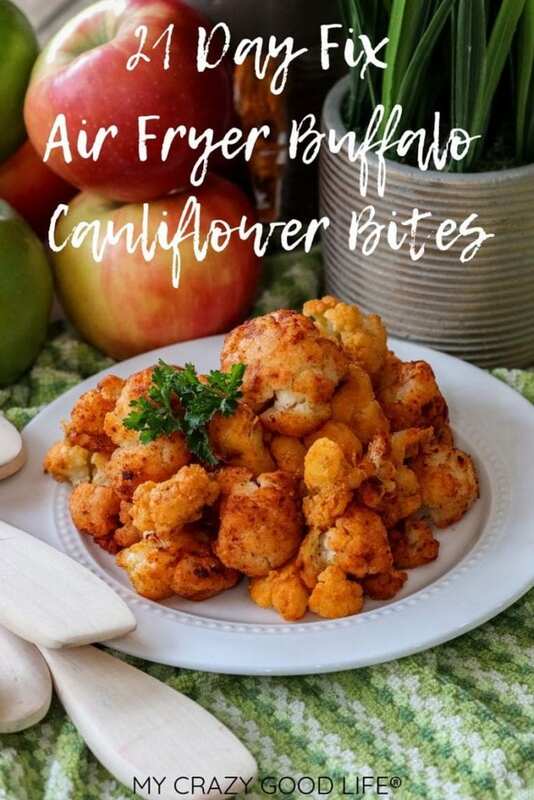 These healthy Air Fryer Buffalo Cauliflower Bites are easy to make and so delicious–they can be served as a healthy appetizer or a low carb side dish, but I promise they’re not going to last long. The first time I served this, I had cauliflower haters LOVING this low carb snack! The best part about it? This recipe uses frozen cauliflower florets–you can’t get easier than this! An air fryer is a small kitchen appliance that works similar to a convection oven. It uses rapid moving air to “fry” food and doesn’t use oil. Are fryers come in different sizes and price ranges, but I’ve found that this one from Amazon is all I need to make appetizers for my family and friends. Does frozen cauliflower get soggy in the air fryer? If you don’t cook the cauliflower enough, it gets soggy. Know that with frozen cauliflower it’ll get a little soggy first and then crisp up! 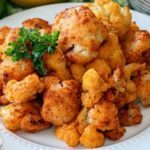 Is this air fryer buffalo cauliflower recipe gluten free? It sure is! I have multiple options for breading and I often make this gluten free. One of the things I love about the air fryer is that you don’t need breading to make things crispy. I’ve used panko bread crumbs, ground up Triscut crackers, and nutritional yeast flakes (these are gluten free) for breading with these buffalo cauliflower bites. They’re all delicious. Can you make these air fryer buffalo cauliflower bites with no breading? I actually started out making these without any breading! I started playing around with panko and Triscuts, then really liked making them with nutritional yeast–but these are delicious without any breading! Can I make these without an air fryer? My friend Teresa has instructions for that over on her blog–she bakes them! Are these Frozen Buffalo Cauliflower Bites Keto? They totally are. Half of the bag has 4 carbs, so these definitely have a place in your keto diet. I love that I can snack on these without guilt :) They do have a bit of sodium in them because of the hot sauce, so make sure to drink a bit of water while you’re enjoying these. 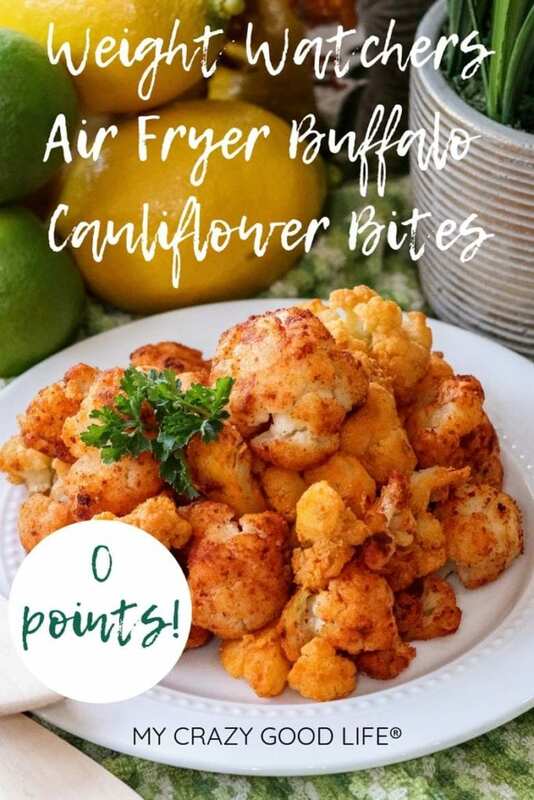 Are these Weight Watchers Buffalo Cauliflower Bites? This healthy appetizer is actually great for just about any diet plan. Half the bag of cauliflower with Frank’s and nutritional yeast is 6 points, but if you choose to not use nutritional yeast on these, they’re free! If you use more than 1 teaspoon of oil, you should count that as a point. Also, different brands of nutritional yeast are pulling up different counts in the WW calculator. I use Now Foods, you can see it here. Is this air fryer buffalo cauliflower whole30 compliant? It is! You’ll have to make sure you’re using a Whole30 compliant oil (EVOO is good), and make sure your hot sauce doesn’t have any additives like sugar, cornstarch, or sulfates. The ones I’m seeing online that are Whole30 approved are Frank’s, Cholula, and Tabasco. How about the 21 Day Fix or Portion Fix? Gotcha covered! Half the bag of cauliflower is about 2 cups, so that’s 2G. If you spray your olive oil you don’t have to count it, but if you feel like you used a lot go ahead and count a teaspoon. Nutritional yeast is free if you’re using one serving, but 1/2 cup will count for about 1/2 red (this is an educated guess on my part, as nutritional yeast is not on the food list). You can use whole wheat panko and count 1Y for 1/2C. Or use 6 Triscuts, crunched up for 1Y. Or skip the breading all together! How do you make Buffalo Cauliflower in the air fryer? Pour half of the bag of cauliflower into a bowl and spray with olive oil, then toss. This helps the hot sauce stick to the cauliflower and gives it more flavor. When I tried this recipe without the oil I had to use a ton of hot sauce and also drizzled some on after they were done cooking. Pour hot sauce over the cauliflower and toss well. Pour nutritional yeast flakes over cauliflower and toss well. This will help your cauliflower bites have a bread-like coating on them that browns nicely. Trust me on this one, I know it looks nasty but nutritional yeast had some pretty great benefits! 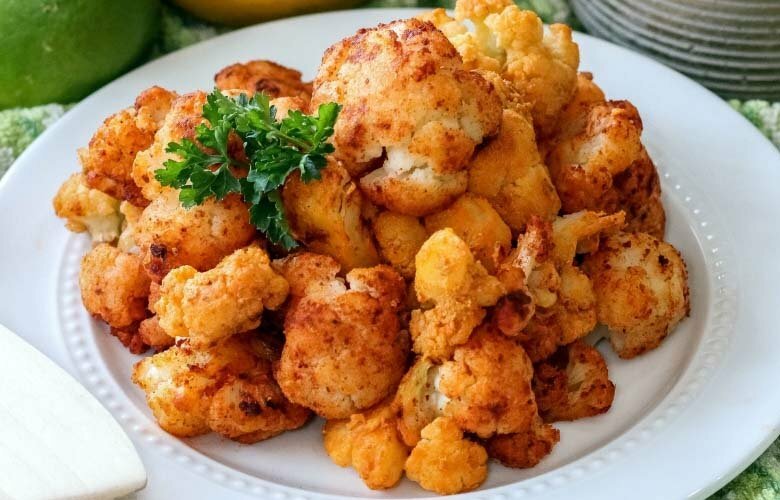 Add your frozen cauliflower to the air fryer and set to 400. I toss them every 5 minutes or so, and they take about 20 minutes to cook. Note: If you drizzle more hot sauce on after pulling them out of the air fryer, it makes them even spicier. Find all of my delicious cauliflower recipes here! Pour half of the bag of cauliflower into a bowl and spray with olive oil, toss. This helps the hot sauce stick to the cauliflower and gives it more flavor. Pour nutritional yeast flakes over cauliflower and toss well. This will help your cauliflower bites have a bread-like coating on them that browns nicely. 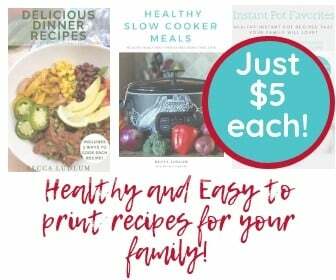 I love using my air fryer for recipes like this one. These are great for a party or just to snack on….so yummy! Thank you for this delicious air fryer buffalo cauliflower recipe. Since I received an air fryer this past Christmas, I can’t use it enough. I’m super excited to try this recipe! Thanks for sharing. Love twists on things and this one is a keeper, even the kids ate it up! What would be the timing on fresh not frozen cauliflower? Judy, I’d recommend 350 for 5 minutes and check every 1-2.